Not much has changed since 1934 as far as kids and cake are concerned. I love the image of these two adorable tikes digging into a picture perfect chocolate cake. 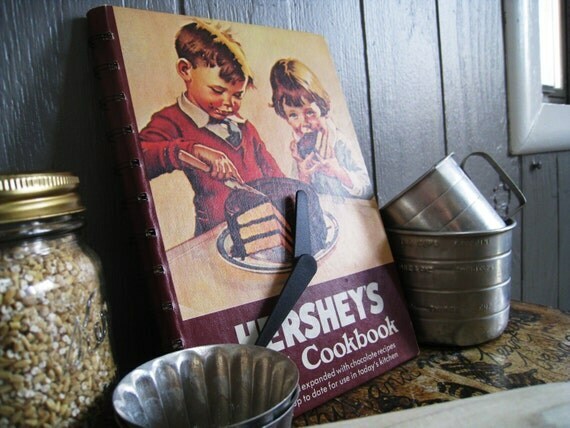 There are few chocolate makers more iconic than the famous Hershey's Chocolate Company so when we found this vintage cookbook we knew it would be the perfect accent piece to any home. We decided to convert it into a charming little wall clock. Folksy :: Buy "Breakfast Bar - brown studio pottery breakfast set"
Folksy :: Buy "Tempus Fugit Vintage Style Clock"